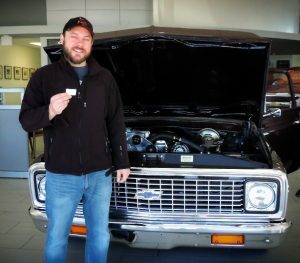 LBJ MUSEUM OF SAN MARCOS raffle winner Theodore Kmiec of San Marcos shows off his winning ticket in front of his fully restored vintage 1972 Chevy truck raffled by the museum. The beautiful truck, valued at $25,000, has been on display at Chuck Nash Auto Group since September. Some 1316 tickets were sold for the raffle benefiting the museum’s Claudia Taylor Johnson (Lady Bird) Endowment which supports exhibits, archives and special programs.